The dust road is the artery of the hinterland. In vast dry countries all over the world these low-ways connect somewhere with nowhere, permitting city-dwellers to savour the pleasures of emptiness and silence, enabling hinterlanders to taste the temptations of the city. 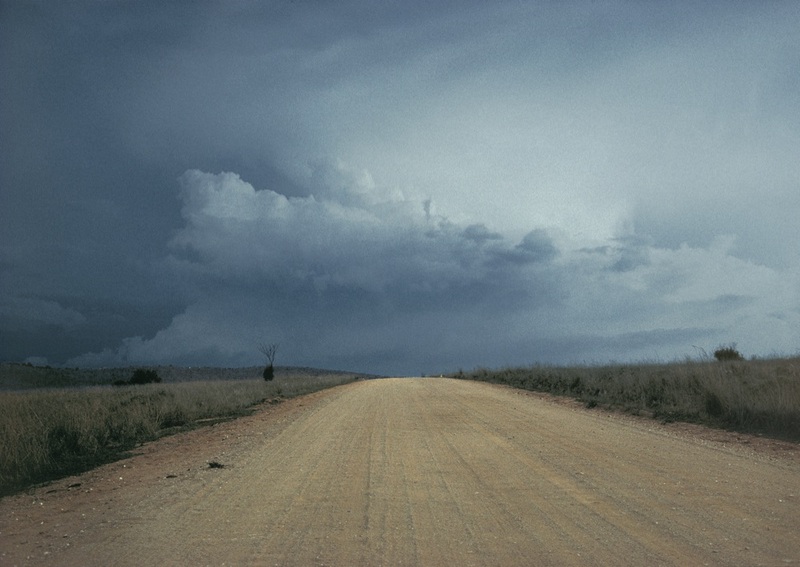 For those who call the big drylands home, there is nothing more evocative than the sight of a distant pick-up truck blazing across a vast scorched landcape trailing a huge billowing cloud of pure gold dust. The sources of household dust are seemingly infinite: clothing, carpets, rugs, mattresses, pillows, quilts, and upholstered furniture, feathers, cotton, wool, hemp and animal hair, human skin scales, animal dander, insect parts, saliva, molds and mildew, bacteria, viruses, and pollen, tobacco smoke from pipes, cigars and cigarettes, cosmetic powders, baby powder, aerosols such as air fresheners, and even—wait for it—cleaning products! The undisputed ruler of this unruly kingdom is a diminutive creature smaller than a flea. Actually the dust mite is an eight-legged monster with no eyes—basically a walking stomach and respiratory system capable of feeding on almost any form of microscopic organic material including moulds, fungi, the remains of other insects, and human skin scales. They thrive in nice warm humid conditions and during their brief 30-day lifespan they manage to make life misery for millions of people with asthma and allergies. The atopic reaction is actually provoked by their waste products which are inevitably inhaled whenever household dust is stirred up; even when they die, their bodies dinsintegrate into tiny fragments which can be absorbed into the lungs. Whatever you do, don’t dust. 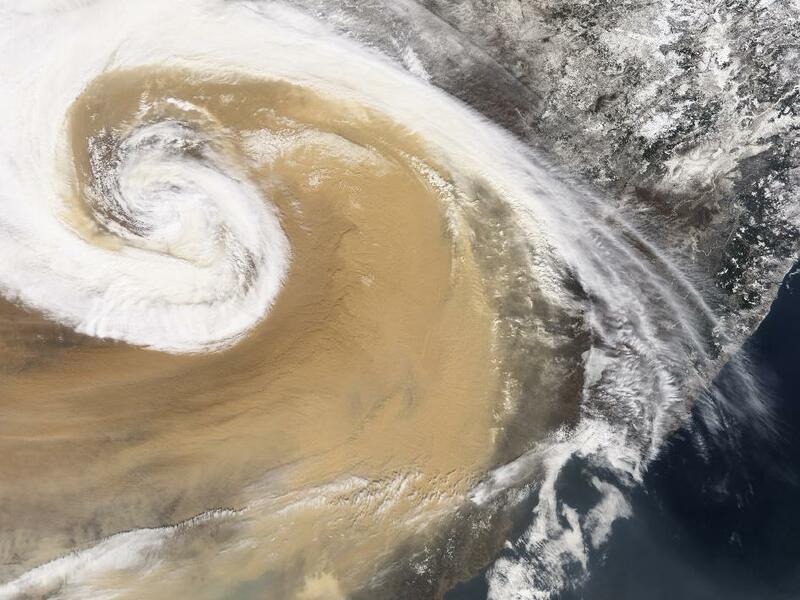 In February 2000, NASA’s SeaWifs satellite instruments captured images of one of the biggest dust storms ever observed on earth. 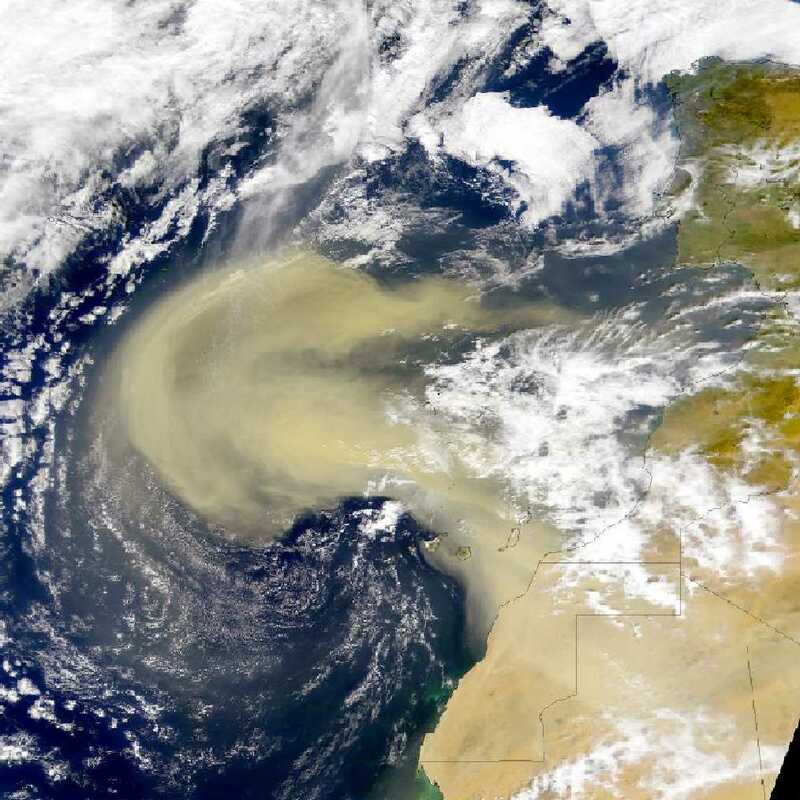 What made the shots so striking was not so much the size of the storm but its location: the one thousand mile wide cloud of Saharan desert dust was well out in the Atlantic ocean, over 1600km from the coast of Africa. These dust clouds can traverse an entire ocean, typically taking five to seven days to reach the Americas. Scientists now believe that powerful high altitude winds are shifting as much as a billion tons of dust a year. As a US Geological Survey microbiologist pointed out, that’s the equivalent of a billion Volkswagens cruising around in the atmosphere. This airborne cargo includes the odd swarm of African grasshoppers that ‘Arrive Alive’ at their ‘holiday’ destination in the Caribbean. Tiny microbes—including toxins, bacteria and fungi—adhere to the soil particles, effectively hitching a long-distance ride from continent to continent, and producing far-reaching effects on opposite ends of the earth. For example there is a growing body of evidence to suggest that a fungus carried by Saharan dust was responsible for the demise of coral reefs in the Caribbean, and that high rates of asthma in parts of the Americas may be ascribed to the storms. Other scientists believe that the dust supplies essential nutrients to the Amazon rain forest canopy. Similar clouds are now being observed off the coast of China as a drought-driven agricultural crisis unfolds in the Gobi desert. 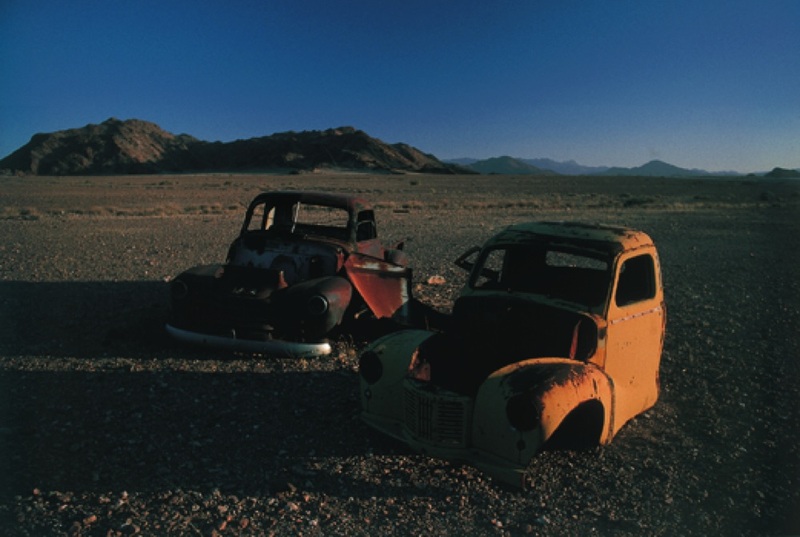 The drought is being exacerbated by an ecological disaster that is the result of overploughing and overgrazing: official figures reveal that the desert is increasing at the rate of more than 2000 square kilometres a year. When the seasonal winds arrive they simply blow the land away. On the ground, the dust storms are so bad that they reduce visibility to virtually zero, rendering transportation impossible. A faded picture from the 1930s—itself pockmarked with scratches and dust—harks back to the infamous Dust Bowl episode that engulfed the Great Plains region of the southern United States. Poor soil conservation practices combined with drought conditions and fierce winds resulted in a decade of devastation and suffering. Vast storms blanketed the denuded fields, hauling sand for up to a thousand miles and then depositing it in twenty foot drifts that buried entire farms. 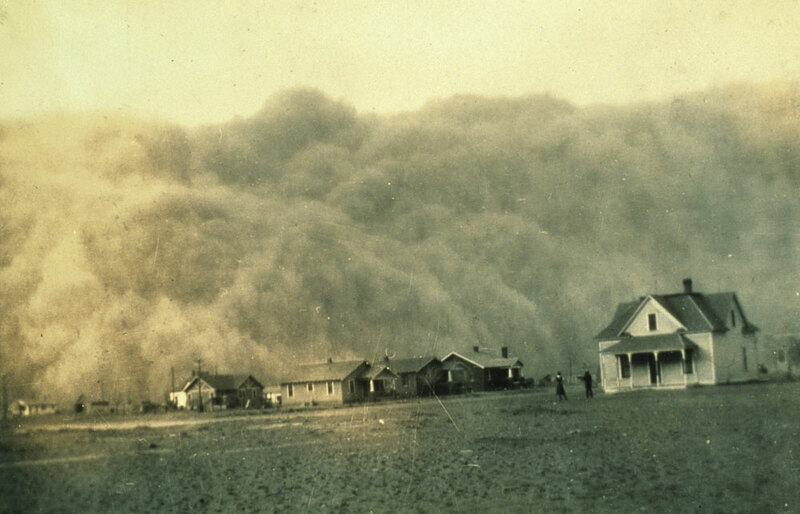 Half a million people abandoned their homesteads in the nineteen states that became the Dust Bowl. The Saharan dust storms are a by-product of Africa’s own Dust Bowl. On three different continents, in China, the United Sates and in the Sahel, similar conditions have combined to produce a strikingly similar result. The humble dust particle has brought a civilisation to its knees. While scientists ponder the impact of a dust storm on one continent for the inhabitants of another, consider this: a Martian dust storm can cover the entire planet. And the Martian moon, Phobos is buried in a layer of dust one metre deep. Or ponder the fate of the mighty dinosaur, the largest creature ever to walk the face of the earth: wiped out by a cloud of dust, after a meteorite struck earth 65 million years ago. Eleven, twelve, twenty kilometres above the earth, where the temperature ceases to vary with changing height, and where clouds of water are rare, millions of motes are mingling. Day and night, like restless insomniac socialites, downwardly-mobile bits of asteroids from the beginnings of time are fraternising with day-old spacecraft debris, rising volcanic ash and floating pollen grains. Suspended in that high blue air these tireless fragments from disparate worlds are doing the stratospheric dust dance. Cosmic dust is to common or garden dust as stars are to stones. Where household dust consists mostly of lint and dead cells, cosmic dust consists of asteroids and meteorites. 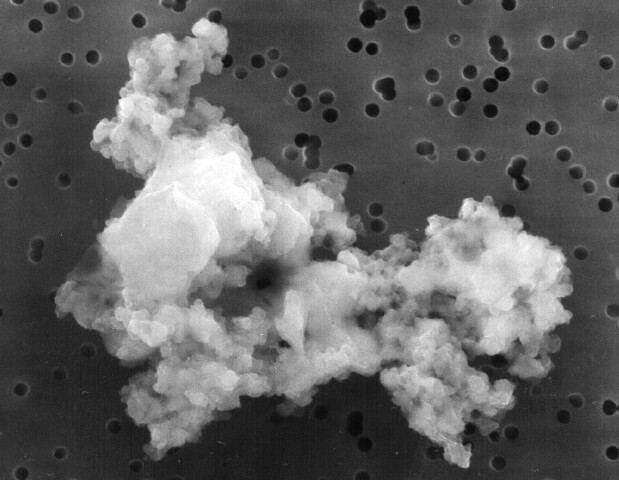 This particle of interplanetary dust, which was collected by a high-flying U-2 aircraft, probably dates back to the birth of the solar system. It is one tenth the thickness of a human hair. In 1981 the ‘ultra-clean’ Cosmic Dust Laboratory was established to ‘curate and distribute’ cosmic dust particles—over two thousand of them. How do you hold a wave upon the shore? How do you hold a moonbeam in your hand? 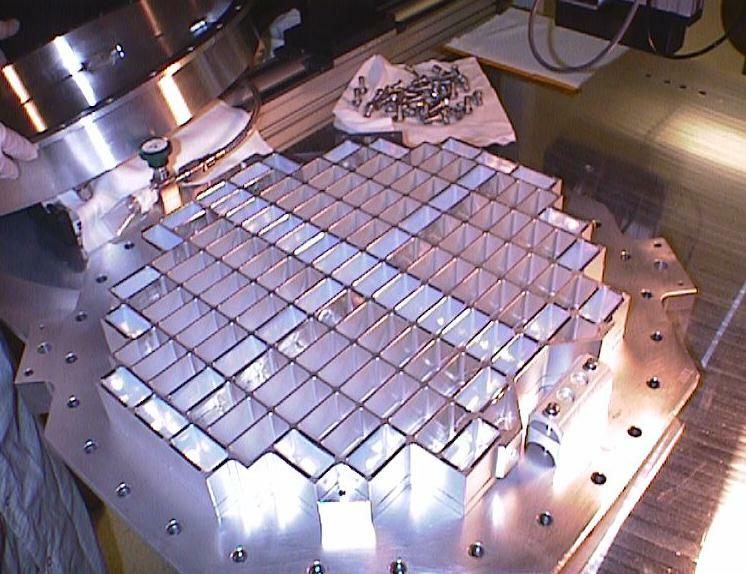 How do you capture stardust? With sticky blue fly-paper called aerogel — the lowest density solid material in the world. In 2004 a high-tech Hoover (actually called 'Stardust') flew into the cloud trailing in the wake of the comet Wild-2 collecting material from stars that predate the formation of our solar system. In order to accomplish this task, Stardust made use of aerogel. Aerogel has also been used to capture ‘local’ dust particles from space. 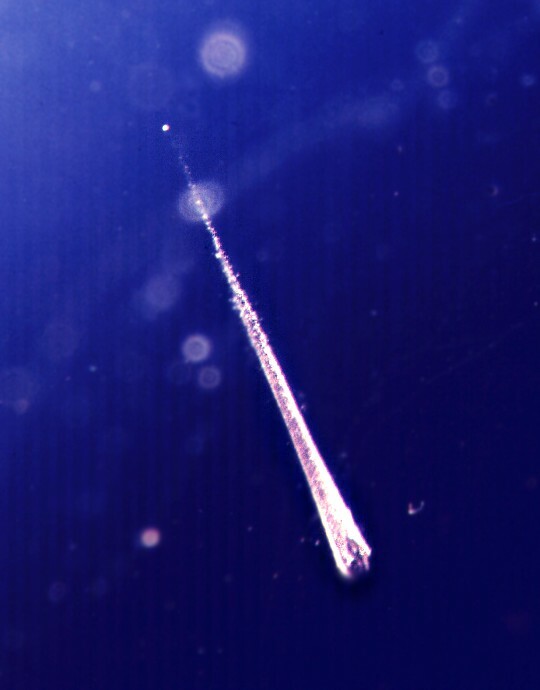 This picture shows the path (five hundredths of an inch long) traced by a miniscule meteoroid through a piece of aerogel. The meteroid itself is visible as a speck of dust at the tip of its trail. The ‘fly’ was caught by hanging the aerogel ‘out of the window’ of a Space Shuttle subcraft. Beyond the solar system there is yet another species of dust. The most exotic and elusive of them all. And although we are billions of miles away from it, we have peered across deep space and watched it dancing like motes in a sunbeam—emitting, reflecting and absorbing light—and from these observations we have been able to ascertain that it is a mere 1/1000th of a millimetre in size. This is interstellar dust and the amount of it in the universe is important because it is a measure of the number of stars that created it. Paradoxically stars are actually formed when gravity causes dust to condense. In 1990 Voyager 1, the only man-made object to have left the solar system, took a ‘holiday snapshot’ of home as seen from deep space - then sent it back. 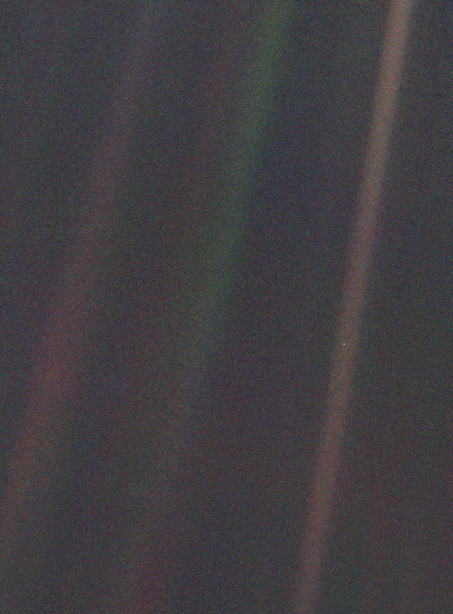 The picture, now known as ‘Pale Blue Dot’, was taken 6 billion kilometers away from earth and on it you can see what looks like a bright speck of dust that shouldn’t be there. That speck of dust is planet earth. “If you look at [that picture], you see a dot. That's here. That's home. That's us. On it, everyone you ever heard of, every human being who ever lived, lived out their lives. The aggregate of all our joys and sufferings, thousands of confident religions, ideologies and economic doctrines, every hunter and forager, every hero and coward, every creator and destroyer of civilizations, every king and peasant, every young couple in love, every hopeful child, every mother and father, every inventor and explorer, every teacher of morals, every corrupt politician, every superstar, every supreme leader, every saint and sinner in the history of our species, lived there on a mote of dust, suspended in a sunbeam.